Tata Pixel: High-end replica for a low-cost Nano Europa! It was christened as dawn of a new era aided by superior technology and engineering efforts. Ratan Tata surprised the automotive industry in 2009 when he introduced the Tata Nano, the 1 Lakh Rupee Car, in front of the world. It was an epic moment. But, now that the Tata Motors have come out with the concept of its new Nano Europa model – the Tata Pixel – for the selected overseas markets; questions are being raised whether Tatas could abide by its lucrative $2500 price tag for the dream car in the foreign markets. 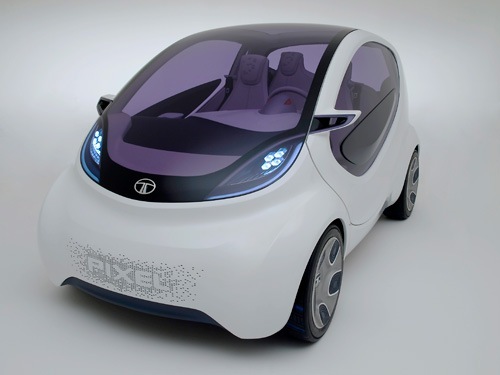 On Tuesday, Tata unveiled its upscale city car concept based on Nano model in this year’s Geneva Motor show, for the European markets. This futuristic Tata Pixel, which is powered by 1.2-litre turbocharged diesel engine, comes bundled with high tech features like optimized aerodynamic drag, low rolling-resistance tyres, stop-start technology and intelligent battery charging. 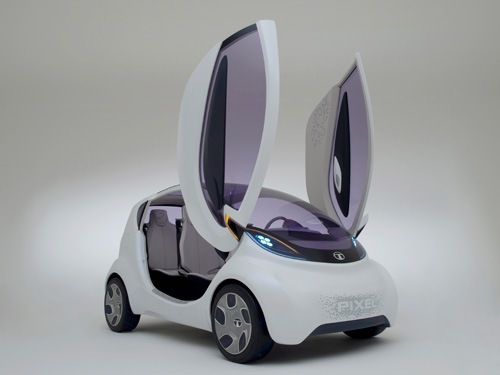 When the ‘Scissor’ doors of this four-seater car rotates upwards to allow passengers in, its exterior-look aided by innovative diamond-shaped door system gives imagery feeling of an angel with the wings spread all around. The 3-metre long Pixel also boasts of the ‘Zero Turn’ drive feature – which enables manoeuvrability and parking of the vehicle in the tightest of spaces through rotation of the outer wheel forwards and inner rear wheel backwards during low-speed manoeuvres, while the front wheel turns at acute angles. This fresh city car concept also comes with integrated human-machine interface concept from Tatas Motors for its new generation programs. What’s more? Europeans will also be able to seamlessly integrate the vehicle’s key controlling functions through their Smartphone or a Tablet. Without any doubt, such high-end features can not be satiated at a paltry $2500 tag. In fact, it can not be done even at double the cost of $5000. So, ultimately, the cheapest car won’t be the cheapest for the Europeans; but a high-end replica for a low-cost Nano. What according to you could be the price-tag of this petit Europeanized car? wow… I want to have one……<3. If “TATA NANO DIESEL ” wanted to be popular famous successful like “RAJNIKANTH” then it should be really launched by january 2012 and I know it will really break all world records of sales of any 4 wheeler ever on earth anytime anywhere for next even 100 years this record will stay in hunt. mind and remeber my words right thing at right time brings right results! INDIAN public is very emotional so best time to cash in and catch in is january 2012. Hey Tata team I wanted to be first customer of TATA NANO DIESEL (TOP MODEL) in INDIA mind it it will break all world records if released and launched at right time in january 2012 , The best time to Launch nano diesel is auto expo 2012 january 2012 then it can break all world records of selling any four wheeler on earth if TATA NANO TEAM and marketing and sales team understands the mentality and psychology of indian public they should launch Tata nano diesel version in january 2012 I m sure it will break all world records of any 4 wheeler sales anywhere on earth! If "TATA NANO DIESEL " wanted to be popular famous successful like "RAJNIKANTH" then it should be really launched by january 2012 and I know it will really break all world records of sales of any 4 wheeler ever on earth anytime anywhere for next even 100 years this record will stay in hunt. mind and remeber my words right thing at right time brings right results! INDIAN public is very emotional so best time to cash in and catch in is january 2012.
. . . Otherwise it is interesting, but worthless. 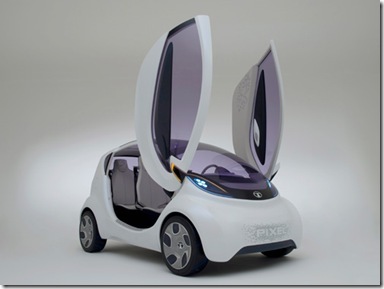 Yeah, electric car – I think they seem to have missed out on this part of going green environmentally. But, it would have been interesting even if Tatas would have disclosed as to what price tag are they garnering from this car. At present, there is no clue on that. ”Kitna deti hai” – Actually, I forgot to mention about this aspect in the above article. Tata Pixel is supposed to give 29.4 km per litre mileage with improved comforts and sophistication as compared to its Indian counterpart – the Nano. This efficient 4-seater car is likely to run with CO2 emissions of just 89 gm/km and combined cycle fuel economy of 3.4 litres/100km. Door system is quite funny. It won’t work. Do they want to promote this car as a sports car or a city car? Being in Mumbai, I’ve experienced the parking crunch many-a-times due to space constraints. Even if there is enough space to park the vehicle in a particular area, opening the doors on either sides is left at quandary.